The name of Dr. Valery V. Polosin (1939—2014), in the recent past — the head of the Sector of the Middle East in the Institute of Oriental Manuscripts of the Russian Academy of Sciences is well known to the specialists in Islamic culture and Muslim manuscript tradition. Research topic of the series of his articles belongs to the category of pioneering ones. So it was understood by the Editorial Board of “Manuscripta Orientalia”, which in between 1995 and 2015 published the first studies of the author in the area of the original Muslim medieval aesthetics embodied in the manuscript design. 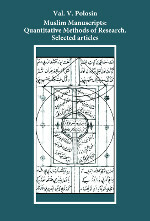 Now these articles are included in the bibliography of the key reference works on Arabic codicology.